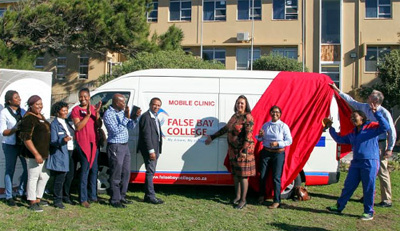 False Bay College launched the first TVET Health and Wellness mobile clinic in the country. The handover of the vehicle took place at the False Bay TVET College Fish Hoek Campus, 04 May 2018, while the College Inter-Campus Sports Day was underway. “The launch of the mobile clinic is indeed a historic milestone for the college. We chose to launch the mobile clinic on our intercampus sports day for a reason. Health a wellness programmes forms part of our strategic focus within Student support. As a responsible institution. We want to be able to focus on the students’ cognitive emotional social and physical well-being, we want to promote student health and educational success through creating a healthy college community.” Said Ms Karin Hendricks, Acting Principal of False Bay TVET College. “We want students to be able to make good responsible choices about their bodies and their health. We need to advocate and help students realise that they need to make looking after their health a priority.” Said Ms Hendricks. The College views each student as a whole person. A focus on mental and physical health and wellbeing also helps to build a positive climate at the College campuses. Care for Health and Wellness focuses on support advocacy and education to our students through various activations throughout the year. The college mobile clinic donated by UCT will operate in partnership with Kheth’Impilo, the Provincial Department of Health and the City of Cape Town. The clinic will provide on-site testing and screening for HIV, TB and STIs, and offer family planning to college students. “Time is a valuable asset to a student and we recognize that bringing services to students saves them time. Instead of sitting the whole day at the clinics and missing classes, they can access health services on site at the mobile clinic. The mobile clinic will visit each of our five campus every second week on a rotation basis with a qualified nurse”. “The College would like to thank Kheth’Impilo CEO, Dr Ashraf Grimwood for takings hands with the college and supporting the mobile clinic in health service provision to the students of FBC.” Said Mrs Karin Hendricks.